Managing contacts and maintaining regular one to one communication with your customers is vital for business success. 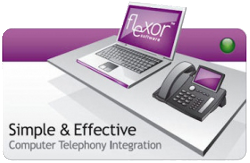 Flexor CTI for Outlook combines this contact management with IP telephone handsets to enable real user benefits such as click-to-dial, contact screen pop-ups, on-screen call control, call logging and call reporting for effective sales management. In combination with Microsoft Outlook, Flexor CTI for Outlook offers a highly cost-effective telephony-integrated contact management solution. However, for those organisations whose requirements are more complex, and who rely on comprehensive Customer Relationship Management (CRM) for business success, telephony integration offers significant business advantage by improving productivity and streamlining business processes. Building on the simple, low cost model of on-demand software, the Flexor CTI family of products adds a new dimension to CRM activity by integrating seamlessly with the leading on-demand CRM systems, which bring full-feature CRM capability to small and medium sized businesses. With telephony such an integral part of CRM activity, Flexor CTI adds the vital ingredient necessary for total customer interaction by capturing call details directly into customer records. Flexor CTI for Outlook offers easily installed and extremely cost effective telephony integration with the world’s most widely used contact manager, Microsoft Outlook.